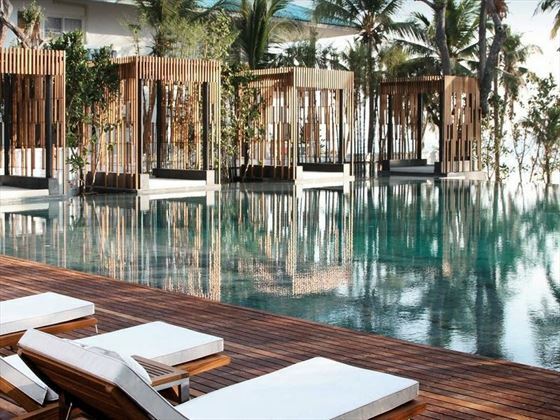 Modern, chic and sophisticated, as soon as you see Cape Nidhra’s beautiful décor and spectacular beachfront pool, it’ll become clear why this property has been named as one of the prestigious Small Luxury Hotels of the World. 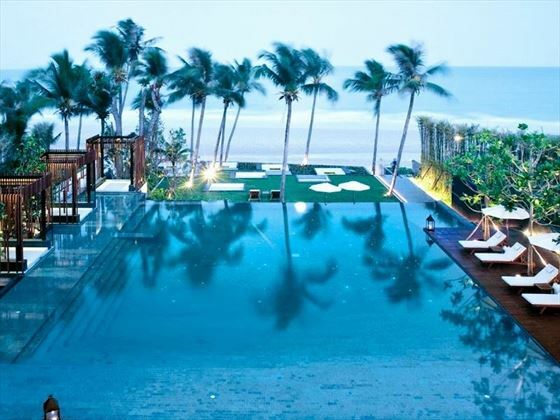 Perched along the sands of Hua Hin’s sugary white beach, you’ll enjoy beautiful vistas as you relax by the main pool, or laze around on your private deck, garden or balcony. 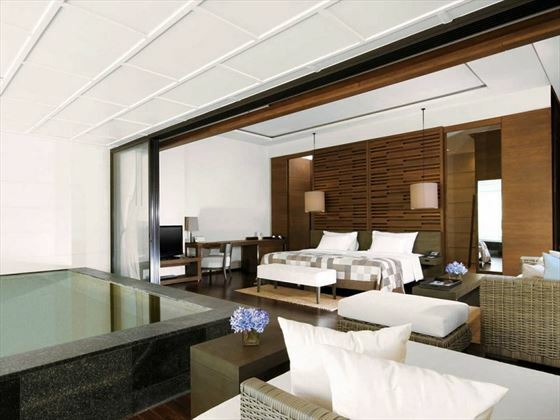 Every suite has gorgeous views and their own pools, creating a truly luxurious feel, and feature contemporary, classy décor. Rocks Restaurant, nestled right by the beachfront pool, is a gorgeous eatery with glass walls and sensational seafood dishes, or you could treat yourself to a refreshing cocktail at On The Rocks, an open-air bar overlooking the Gulf of Thailand. Fancy the ultimate pamper? Head to the Cape Spa for a lovely massage, listening to the waves lapping on the shore as you truly relax. 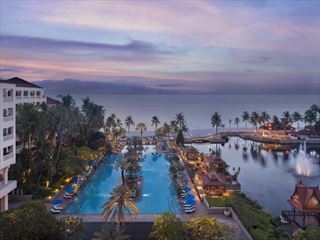 The hotel is located in Hua Hin, a charming seaside town on the Gulf of Thailand. Cape Nidhra has easy access to the town’s markets, restaurants and lively nightlife, meaning you can spend your days doing as little or as much as you like. 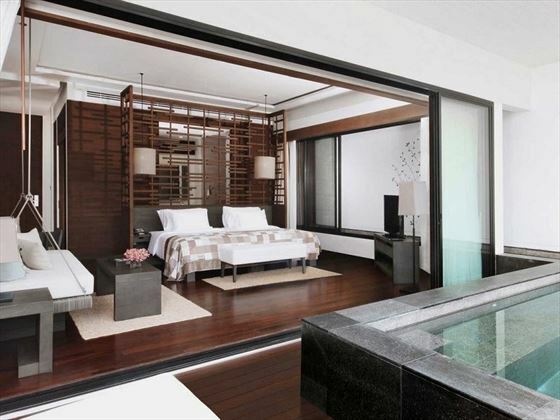 Sky Pool Suite – Beautiful 80sqm suites, featuring a private pool and covered deck perfect for relaxing in peace. Deluxe Sky Pool Suite – Spectacular 101sqm suites, with an expansive balcony featuring a private pool looking out onto luscious flora. 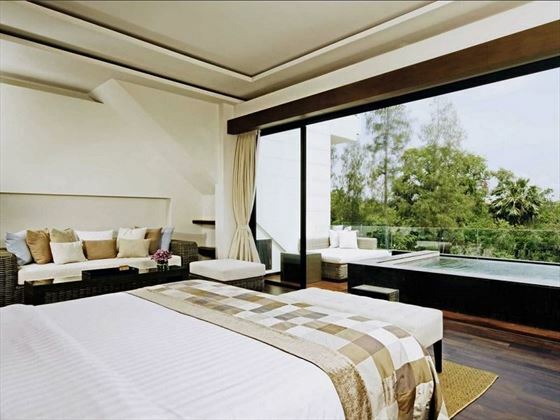 Garden Pool Suite – Wonderful 126sqm suites with a spacious, airy feel, featuring a small garden with a private pool. These suites are ideal for small families thanks to the extra outdoor space. Moonlight Pool Suite – Bright and spacious, these 110sqm suites have two floors, with extra decks on the second floor to allow guests to soak up the sun. The upstairs decks are very large, and overlook the thick forest. Family Pool Suite – Charming 144sqm suites located on the second floor, featuring two bedrooms, a private pool, and a Jacuzzi in one of the ensuite bathrooms. 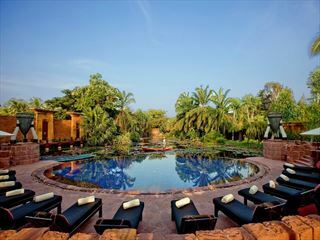 Nidhrarom Suite – These 300sqm suites are the most sophisticated, with a stately bedroom framed by wall-to-wall glass doors that leads on to the spacious outdoor decking area with a long private pool. The bedroom can be turned into two. Rocks Restaurant – From the sloped glass ceilings, to the gorgeous outdoor seating area right by the pool, Rocks Restaurant is stunning. 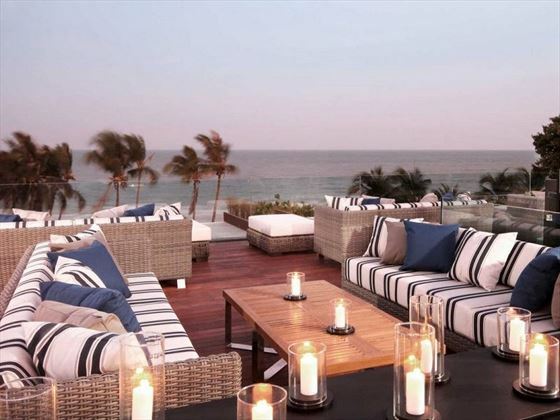 The lovely décor pairs nicely with the delicious mix of local flavours and fresh seafood. 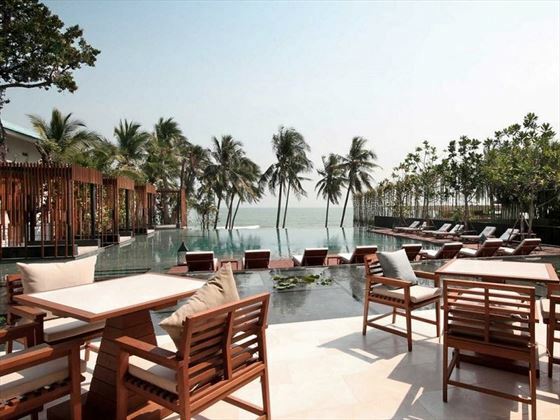 On the Rocks – A wonderful open-air bar offering a chic, social vibe and spectacular views of the Gulf of Thailand. Beach Dinner – Enjoy a unique dining experience with a meal under the stars, sinking your feet into the sand as you dine on sumptuous seafood and traditional Thai cuisine. Cape Spa – An elegant spa offering true tranquillity, nestled on the beach front to create a serene vibe with the soft sounds of the waves and the cool breeze. Treatments include sensational massages and rejuvenating facials. There is also a steam room and a sauna.